They were sleeping peacefully on a top floor of the hotel room in Washington D.C. with an 8 month old Riley between them when the bombs shook her awake, the entire building quaking. Dawn darted upright, still dazed and wide eyed, searching for answers. The flashes of light blazing through the slats in the shades and echoes of explosions were close. 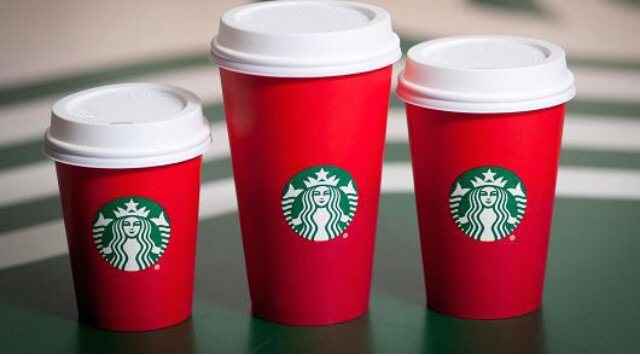 Ok, so let me start by stating that this whole #MerryChristmasStarbucks over a cup is the kind of news that should not be reported and I realize that by writing and posting this, it’s adds the proverbial fuel to the fire. But this time of year is especially hard for so many people and stories like this truly highlight why. I’m Jewish. My husband is Catholic. Our children learn both and accept the differences. We practice together and our children have no confusion on either, although they do ask a lot of questions because that’s what kids are supposed to do. I go into our children’s classrooms at public school to give a little schpiel (aka: social studies/history lesson) about real religious persecution (the story of Hanukkah) followed by a math lesson on gambling (dreidel) and then hand out spinning tops and chocolates wrapped in gold because I’m cool like that. Lady J: Mom, can we play on the beach playground? Lady J: You know… The green and brown one. It’s right on the beach. The one with the climbing things and tunnels. 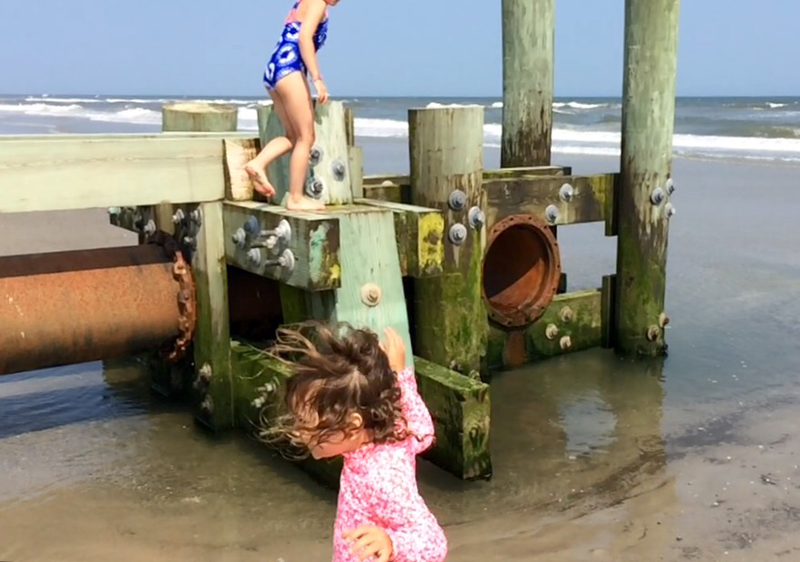 Me: There’s no playground on the… Wait, you mean the drainage pipe? Sure… Why (the heck) not. (I feel like getting berated by complete strangers as to how I should raise my children anyway. *) Let’s go! Lady J: Thanks, Mom! You’re the best mom we’ve ever had! A few nights ago I was sitting alone on a boardwalk bench doing a whole lot of nothing important. The cool night sea air was calming and the stars were out in abundance. I sat there for over an hour, taking in the hushed summer calm, breathing deeply, and just being. Many people walked by carrying on their own conversations about life with the company they were sharing on their walks. I only heard what was spoken loudly enough to hear and caught mere snippets into their lives as each couple or small group passed. Some shared stories of their day: the frustration or successes at work or in personal lives. While others spoke of ideologies or politics. Jokes were told and laughter shared. Empathy or sympathy was offered if needed. And there was an overall feeling of camaraderie and humanity. I was still in shock and said nothing. They kept walking and that was it. But that wasn’t it. Not at all. Not even a little bit. When I was in first grade I had a play date over and as we played our religions came up in conversation. She was Christian. Upon hearing that I was Jewish she said very matter-of-factly, “You killed Jesus.” I have no recollection what my response was. I know that we were 6. I know that at the time I knew very little of Jesus, except that I didn’t believe in him as God. And that was it. When I was a student at Akiba, a Jewish day school, during Operation Desert Storm, the school was on lock down and high alert for security reasons. It was located near an orthodox community and on 3 of 4 corners of the intersection stood a Jewish elementary school, a Jewish middle/high school, and 2 synagogues. The area was considered a potential target so precautions were made: Outer doors were to be kept closed and locked, book bags left unattended were checked, and those students with off campus lunch privileges had to sign in and out at the office. And that was it. When I went to Poland as a junior in high school, there were less than friendly bystanders watching the 5000 participants on my trip symbolically walk the March of Death from Auschwitz to Birkenau on The March of the Living. If I recall correctly, there were a few onlookers who made inappropriate gestures at us. We ignored them and marched on in silence. And that was it. When I taught religious school and preschool, pre-9/11, the synagogue received a bomb threat one Sunday morning. We calmly evacuated the students and authorities were called. Regular classes resumed the following morning. And that was it. …Yet NEVER have I experienced such BLATANT anti-Semitism as I did a few nights ago. I tried to convince myself that it wasn’t personal. But it is. I tried to think that it’s just an uniformed, ignorant person connecting all members of a specific religion to one country. But it’s so much more. I tried to separate the two statements and wondered in disbelief: How could disagreeing with a specific country’s defense and subsequent response to ACTS of TERROR make every member of that religion “scum?” But I was left with no logical or humanitarian answer. I, as a member of the Jewish religion and people, do support Israel but I do not find her infallible at all times. I do believe that Israel has the right to defend herself and should continue her offensive to rid the world of a KNOWN TERRORIST ORGANIZATION. I also, DO NOT confuse Hamas with ALL Palestinians nor ALL Muslims. I am pro-Israel during this questionable time. But more importantly, I am anti-terror at ALL times. I feel badly for any loss of civilian lives on either side, yet recognize that it is an unfortunate and unavoidable consequence of war. And I commend Israel for trying to prevent and avoid such losses, a fact that much of the media fails to report. I am also an American. I am not an Israeli, although Israel would grant me citizenship purely based on my lineage. Yet based on the ignorant, uninformed, HATEFUL comment that connects a political disagreement to an ENTIRE people while walking down the boardwalk in a predominately JEWISH area of the NJ shore, it is clear that I may need to become Israeli, one day. That unfortunate fact is exactly why I support Israel. That hateful statement I overheard is proof that I NEED her. She is a safe haven for me and my family, no questions asked, purely because I am Jewish. I cannot say the same for ANY other country, especially based on the recent global anti-Semitic violent acts and demonstrations that have surfaced with unabashed JUDENHASS (Jew-Hatred).